Announced in September 2012, the Canon EOS 6D is a high-end, full-frame camera ideal for enthusiast and advanced photographers, or professional photographers looking for a second camera body. Its resolution and AF system mark it out as a camera that is aimed at those shooting portraits or landscapes, where good resolution and a full-frame sensor are key, but where the fastest AF is not as important. An overall score of 82 is very good for Canon, but is still a little way below the best from Nikon. An overall DxOMark score of 82 put the EOS 6D right at the top of the tree in terms of Canon cameras, matching the score produced by the flagship EOS-1D X. In the sensor rankings, it ties with the Nikon D3s and the medium format Pentax 645D. However, this does only rank it around 10th, a fair way below the current top rated camera, the Nikon D800E that managed a score of 96. Looking at the scores in detail, we can see the main weakness of the current round of Canon sensors has again shown through here, that being relatively low scores in both the Portrait (Color Depth) and Landscape (Dynamic Range) scores. It’s score of 23.8bit for Color Depth being 1.8bits lower than the Nikon D800E and its Dynamic Range score being 2.2EV lower. However, with that said, this sensor still provides acceptable results, especially given the price of the camera, it’s only when comparing against the current best on the market that it loses out. From a usage scenario, the EOS 6D will perform well in all areas, with the possible exception of very high contrast scenes, for example when shooting sunrise or sunset, where the Dynamic Range may affect your results. One area where the EOS 6D does do quite well though is in the Low-Light ISO score. Here its score of 2340 ranks it 7th overall. In the Canon range, it is only outperformed by the EOS-1D X. It does show a significant improvement over previous models, as has been seen in the latest sensors from all manufacturers. Although the score is 2340 ISO, in real world usage, you will still achieve very high image quality shooting at ISO 3200 without worry. 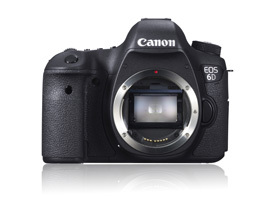 Finally on the ISO scores, as with several cameras now available, the EOS 6D offers an ISO 102,400 setting. In this case, it is only available as part of the expansion ISO settings indicating that Canon feel the image quality is not good enough for normal use. Indeed, as with all cameras currently tested, the results are very low suggesting you really should only use these settings when there is no other alternative. Looking at the performance of the camera as a whole, while it may seem strange to talk about value for money on something that costs $2099 USD, the EOS 6D does offer great performance and a very well thought out feature set. In terms of low-light performance relative to cost, the EOS 6D is only matched by the Nikon D600. This comparison sees the battle of a new market sector, that being the mid-range full-frame camera. Straight in at the top of this sector, the Nikon D600 outscores the Canon EOS 6D in every testing metric. The DxOMark Overall Score of the Canon EOS 6D falls a fair way short of the Nikon D600 (82 vs 94). The closest score between the two cameras is for Low-Light ISO, where the Canon EOS 6D scores 2340 to the Nikon D600’s 2980 – but this still represents a difference of almost 1/3rd stop. This is not to suggest the EOS 6D is a bad camera – far from it, but in comparison with the best in its sector, its image quality could be higher. Which camera of these three that you choose should therefore be decided by what you want to shoot? If you are a landscape photographer, the EOS 6D will serve you better. If portraits are more you main subject, then the EOS 5D Mark III will be best and if you shoot in low light, at weddings, sports events or as a photojournalist, then the EOS-1D X makes the most sense. As a final comparison, let’s look at how Canon’s full-frame sensors have evolved over the last few years. These three cameras represent a transect through the last 8 years of Canon CMOS sensor development. Interestingly, the overall scores for these three cameras are not that different. There is a jump between the EOS-1Ds Mark II and EOS-1Ds Mark III, but the EOS 6D actually out performs the other two models. In terms of Color Depth, the EOS-1Ds Mark III is at the top, with 24bits, but the EOS 6D is only fractionally behind on 23.8bits. For Dynamic Range, again the EOS-1Ds Mark II is behind, as expected, but the EOS 6D is now on top. Again however, the difference is not that great, and certainly not enough to be visible in final prints. It’s in ISO performance where the biggest differences appear. The EOS-1Ds Mark II and EOS-1Ds Mark III both score just either side of 1500 ISO (1480 and 1663 respectively). The EOS 6D though shows a marked improvement, with a score of 2340 ISO. Looking in a little more detail, we can see from the SNR 18% chart, that the EOS 6D outperforms the older models at all ISO settings, pointing to a good improvement from Canon. Despite the improvements in ISO performance, the Dynamic Range at low ISO settings shows a slight increase from EOS-1Ds Mark II to EOS-1Ds Mark III, but very little improvement in the 5 years since then. Considering the EOS-1Ds Mark III was the pinnacle of Canon cameras when it launched in 2007 and had a price tag of $7100 USD, the EOS 6D shows a major benefit in trickle down technology and now offers matching or better performance, with almost the same resolution, for only $2099 USD.